Originally uploaded by Stellae et Luna. Two and a half years ago, just after I moved to Berkeley, I was standing on Angel Island, a protected natural area and California State Park near San Francisco when a professor from my department asked me, somewhat rhetorically where else in the world I could go and be standing in the middle of untouched nature (or mostly untouched, at least) and looking back at an urban landscape. In January, I found the answer. Travel out of Queenstown had proven difficult, resulting in a flight back to the U.S. a day later than planned, and, relatedly, an extra day to explore Auckland City. While there is a lot to see there that I hadn't yet, the Sky Tower, the Auckland Museum, a whole district for shopping, I decided to spend my afternoon taking a ferry out to the Hauraki Gulf's "youngest" volcanic island, Rangitoto. (Young, here is in geological terms... the most recent eruptions ended approximately 500 years ago, with no sign of returning). The island is uninhabited, being another scenic preserve; various harbour ferries stop there on a daily basis, dropping off and picking up visitors who wish to climb up and around it shield cone and crater. It was inhabited in the past, and like many large (or largeish) islands, was used for military purposes. This one was used as part of the Auckland Defense in World War II; a series of plaques tell about its history in an old observation center at the island's summit. A train takes visitors most of the way to the summit (to get all the way there, you have to climb a couple hundred stairs along a boardwalk that spirals its way around the volcano's cone... well worth it for the beautiful, 360 degree views of Auckland City and the many islands of the Hauraki Gulf). 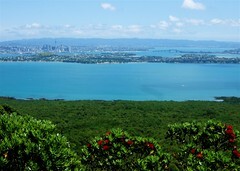 During the ride, I learned the history of the island, saw a number of pohutukawa trees (called "New Zealand Christmas Trees" because of their bright red flowers that bloom in December and January each year) and tea trees (from which "tea tree oil" is produced) growing straight out of inky black volcanic rock. Like Angel Island, which has lush vegetation overgrowing the rocky cliffs that fall into the salty bay water, Rangitoto is for the most part lush, green and unspoilt. And it has a rather remarkable view of a very nearby city.